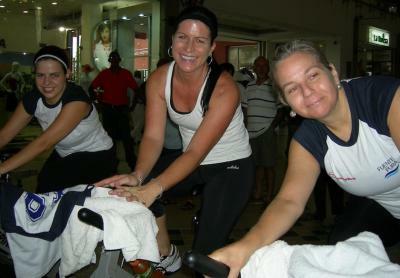 Today in the mall Galerías, along with 5 of my students from my spinning classes, I participated in Managua's 4th annual spinning competition. It was held on the mall floor, with our bikes facing a stage where instructors gave us routines to follow, and while mall shoppers looked on (haha)! My students competed in the "beginner" event (60 mins), and I competed in the "advanced" (90 mins). It was a blast! I was SO proud of my students, two of whom (pictured here) took 2nd place, 1 in "damas" and 1 in "masters"; another male student took 1st place in "masters". The judges evaluated several things: cadence, "fuerza" (resistance on the bike), and position. What a fun way to promote fitness! I have really enjoyed teaching spinning here, many of my students have gotten back into working out for the first time in years as a result of my classes, and it is truly gratifying to be a part of people feeling happy & healthy! salud y bicicletas!! !